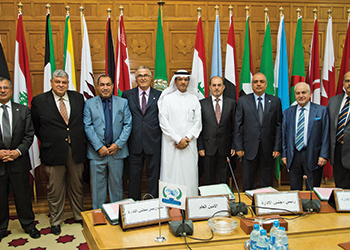 The Arab Union of Land Transport (AULT) at an invitation of the general secretariat of the League of Arab States (LAS) held its annual board members and general assembly meeting at the League’s headquarter in Cairo, Egypt on May 20 to 21, 2015. This is the first time to hold such meetings in the premises of Arab League that only reflects strong cooperation between the two organisations. The meetings were under the patronage of Dr Mohammed Bin Ibrahim Al Tuwaijari, assistant secretary general for Economic Affairs, in the presence of Ambassador Mohammed Al Rabie, the secretary general of the Council of Arab Economic Unity (CAEU) and Dr Dina El Zaher, director of transport and tourism administration at the League. Dr Al Tuwaijri welcomed members of the Union to the LAS headquarter and wished success in the meetings. He praised the joint Arab cooperation in raising higher standards in the land transport sector of the region and the importance of support to the Union’s future initiatives to form bilateral and multilateral agreements. The secretary general of the Arab Unity Council, Amb Mohammed Al Rabie also iterated the important role the Union plays to serve the land transportation sector. The speech was followed by a thank you note by the chairman of the Board of the Arab Union, Abdullah Ali Almajdouie, to the general secretariat of the Arab League for hosting his fellow colleagues and dignitaries. He reaffirmed that the Union will continue its efforts to serve the road transport sector in the Arab world. Dr Mahmoud Abdallat, secretary general of the Union, also expressed his pride and gratitude for holding the Union’s meeting at the Arab League, which confirms the League’s support to the Union. In his talk, he briefed the group on the initiative of AULT in cooperation with the Ministry of Transport of Jordan and the International Road Union to set up a supervisory training centre specialised in road transport. The board members commenced its agenda, which included its annual report review, memberships related matters, in addition to modifying its statutory conditions. Two of the Union members, Abdullah Luebi from Iraq and Bandar Al Jabri for Saudi Arabia, were honoured outstanding members of 2014.